This low, downy annual flowers in grassy, well-drained places throughout Ireland from April until September. 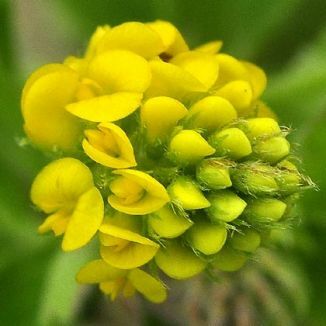 It's tiny, bright yellow peaflowers are clustered together – between ten and fifty of them – into a rounded 3-8mm head which is borne on a long slender stalk. 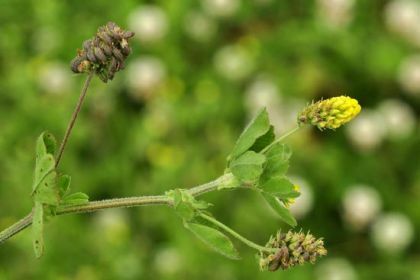 The leaves are trefoil and the oval, toothed leaflets have a tiny point. The seedpods become black when ripe and are kidney-shaped. In common with many other pea-flowers, this plant is much beloved by bees as a source of nectar. It is a native plant and belongs to the family Fabaceae. I first identified this plant in Killiney, Co Dublin in 1976 and photographed it there in 1995 and in Gibletstown, Co Wexford in 2006. A source of nectar for many butterflies including the Common Blue (Polyommatus icarus or Gormán coiteann) seen feeding in the photograph. Identification of this butterfly was made for me by Michael O'Donnell, a fellow member of the Wexford Naturalists Field Club. 'This is often sold in the streets of Dublin on St Patrick's Day, the Seventeenth of March, as the true Shamrock, as it is usually of more precocious growth than either of the Trefoils, Trifolium repens (White clover) and Trifolium minus*, which are generally worn in Ireland as the national badge'. *Trifolium minus is another name for Trifolium dubium which Colgan also called Seamróg or Shamrock.